Courses taught at the CEA Barcelona Center have been designed in conjunction with, and approved by, the University of New Haven (UNH). UNH also approves faculty appointments. After the successful completion of a session at the CEA Barcelona Center, students will receive credit for their work from UNH. UNH is regionally accredited by the New England Commission of Higher Education (NECHE), formerly known as the Commission on Institutions of Higher Education of the New England Association of Schools and Colleges, Inc (NEASC). The CEA Barcelona Center was founded in 2005 in order to provide an interdisciplinary liberal arts education, enhanced by the Center’s location in the heart of Barcelona, Spain. Courses are offered in both Spanish and English and give you the opportunity to both improve your language skills and further your academic pursuits in a variety of subjects with Barcelona as your classroom. Courses bring the diverse history, politics, culture, economics, and art of Spain to life, incorporating components that expose you to different elements of the city, from monuments and museums to businesses, local food markets, and government agencies. You’ll be encouraged to explore on your own and draw connections between the subjects you study and the observations you make outside of the classroom. Not only will you get to know your host city, you’ll also gain insight into how Spain fits into the larger European context. 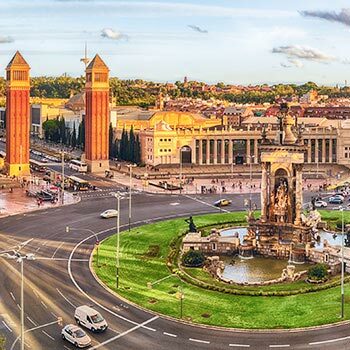 CEA Barcelona Center curriculum provides the tools and direction you need to both learn about Spain, and to reflect on your own country and culture. Expect to actively participate in classes, as faculty will facilitate your intellectual, cultural, and emotional growth through lively discussions. Classes are taught by international faculty. Most faculty are bilingual (Spanish/English) and represent a variety of different backgrounds. You’ll attend class with other CEA students of equivalent language levels, not with native Spanish students. Teaching styles in Spain may differ from those in the U.S. Be prepared to adapt to your school’s classroom structures and coursework expectations. The maximum class size is 15 students for language courses and 25 students for electives. Small class sizes mean more personalized attention from your instructors. Professors at the CEA Barcelona Center carefully evaluate student's work and progress throughout their academic session. When calculating final grades, instructors consider written and oral exercises, homework assignments, attendance, classroom participation, and exam performance. The Universitat Autònoma de Barcelona is recognized by the Spanish Ministry of Education as a degree-granting institution of higher learning. The Universitat Autònoma de Barcelona (UAB) was founded in 1968. Today, UAB offers undergraduate, master’s, and doctorate programs in the fields of humanities, social sciences, health sciences, experimental sciences and engineering. UAB’s links with local institutions, industry, and businesses provides students with practical experience helping them to be better prepared as they enter the professional world. More than 17% of UAB’s 50,000 students are international. UAB encompasses several campuses; CEA students may attend classes at la Casa de Convalescencia in the city center, close to Gaudi's famous Sagrada Familia. The building was completed in 1930 and granted UNESCO World Heritage Site status in 1997. CEA students may also attend class on the Eixample campus, located on the same metro line (and within walking distance) of the CEA Study Abroad Center. International faculty will teach your courses. Homework assignments and final exams will be administered. Teaching styles in Spain may differ from those in the U.S. Be prepared to adapt to UAB’s classroom structures and coursework expectations. Class size is a maximum of 40 students. You will attend class with international students from the U.S., Europe, Canada, and other parts of the world. Due to the superior mastery of the language required, you will not be in classes with host national students. The Spanish grading system is based on a scale of 10, as opposed to 100 in the U.S. system; however, grading varies from subject to subject. For example, in mathematics, a student may receive a 10 for completing all the problems correctly, whereas in the humanities, a 7 on an essay is considered very acceptable. Grading in Spain can be severe, and grades of 9 and 10 are rare. Transcripts from Spanish universities list both numerical and verbal grades. Please note that this grading scale is recommended by CEA and Universitat Autònoma de Barcelona, but final credit and grade evaluation is ultimately determined by your home school. The University of Barcelona is recognized by the Spanish Ministry of Education as a degree-granting institution of higher learning. Founded in 1450, the University of Barcelona (UB) is the oldest and largest university in Catalonia with a student population of over 90,000. UB emphasizes international relations and has been a leading host of study abroad students for many years, welcoming 5,000 international students each year. The university awards more than 10,000 bachelor’s degrees and 450 doctorates annually. UB operates four campuses throughout the city. Classes are instructed by university faculty through Estudios Hispánicos at both the main campus—centrally located in a 16th century building—and a secondary campus located just outside the city center and easily reached by metro or bus. International faculty teach language courses and electives. Teaching styles in Spain may differ from those in the U.S. Be prepared to adapt to the UB’s classroom structures and coursework expectations. Class size ranges between 10 and 20 students for language courses and electives, and between 30 and 70 students for culture electives. We have found verbal grades to be more universal and reliable when determining U.S. grade equivalents. Therefore, even though a numeric grade is listed, we rely primarily on the verbal grade, since the verbal grading scale is consistent across Spanish universities. Pompeu Fabra University is recognized by the Spanish Ministry of Education as a degree granting institution of higher learning. Since it was founded in 1990, Université Pompeu Fabra University (UPF) has had two goals: to train responsible professionals and citizens who are committed to civic values, and to contribute to the development of research. UPF welcomes approximately 10,000 students each year, 800 of which are international, and offers degrees in law, economics, business, social sciences, communications, health, life sciences, and technology. The university operates six campuses scattered around Barcelona's city center. CEA students take most classes at the campus located near Olympic Village. Unlike most Spanish institutions, UPF follows a trimester-based academic calendar. The university prides itself on offering small class sizes, dedicated teaching staff, and advanced technological and information systems. Spanish language and elective courses for international students are instructed by university faculty in both Spanish and English through the Hispanic & European Studies Program, the Pre-Law Honors Program, and International Business. In addition, you may choose to take integrated courses in Humanities, Business, Communications, and more alongside Spanish students. Teaching styles in Spain may differ from those in the U.S. Be prepared to adapt to UPF’s classroom structures and coursework expectations. Class size ranges from 10 to 20 students for language courses and a maximum of 35 students for electives. For those participating in the integrated option, the class size of regular university courses range from 15 to 80 students. You’ll take most classes with other U.S. students of equivalent language levels, not with native Spanish students. Students participating in the Integrated Studies program have the option to take courses with native Spanish students in both Spanish and English. The University of Vic - Central University of Catalonia (UVic-UCC) is recognized by the Spanish Ministry of Education as a degree granting institution of higher learning. The University of Vic - Central University of Catalonia (UVic-UCC) is an independent, state-supported, educational institution with a distinctive international focus. UVic-UCC is committed to the economic and social development of Barcelona and Catalonia through teaching, research, and knowledge transfer. The university emphasizes multilingual training as a key to increased mobility of university students and staff, and views the study of language and culture as an excellent vehicle for gaining a wider awareness of today’s world. UVic-UCC offers 32 bachelor’s degrees in the fields of arts, humanities, science, health sciences, social sciences, and engineering, 15 master’s degree programs, and six doctoral programs. UVic-UCC’s compliance with European directives on higher education, and the more-than 20,000 students who have put their trust in the university over the years, is testament to UVic-UCC’s dynamism, innovation, and quality. The UVic-UCC International Campus, an umbrella organization for UVic-UCC activities aimed at an international public, provides mobility and exchange programs, postgraduate courses, research programs, continuing education, and international cooperation projects. The UVic-UCC campus is on the same metro line as the CEA Barcelona Center, just a 10-minute ride away. International faculty will teach marketing and entrepreneurship courses. Teaching styles in Spain may differ from those in the U.S. Be prepared to adapt to UVic-UCC’s classroom structures and coursework expectations. Class size is a maximum of 25 to 30 students. You will attend class with international students. Due to the superior mastery of the language required, you will not be in classes with host national students. Please note that this grading scale is recommended by CEA and University of Vic, but final credit and grade evaluation is ultimately determined by a student’s home university. The ESADE Business School is accredited by EQUIS (European Quality Improvement System), AACSB (Association to Advance Collegiate Schools of Business) and AMBA (Association for MBA programs). ESADE Business School (ESADE) is one of the top-ranked business schools worldwide and holds the rare distinction of triple accreditation through EQUIS, AACSB, and AMBA. This private institution of higher education was founded in 1958 and has since established close ties with business, economic, and social sectors to deliver an innovative learning model. CEA students will take classes at the Barcelona- Sant Cugat campus, located 30 minutes from the city center in the nearby town of Sant Cugat del Vallé. CEA students have access to all university facilities and will be able to take courses in English with other international students. Courses are taught by ESADE faculty. Teaching styles in Spain may differ from those in the U.S. Be prepared to adapt to different classroom structures and coursework expectations. Classes are attended by students from around the world. All business electives are taught in English. Class size is, on average, between 15 and 30 students. CETT – University of Barcelona (CETT-UB) is an affiliated center of the University of Barcelona, dedicated to the education, research, and knowledge transfer in the fields of tourism, hotel management, and gastronomy. CETT-UB is recognized by the Spanish Ministry of Education as a degree-granting institution of higher learning. CETT-University of Barcelona (CETT-UB) is the University of Barcelona’s School of Tourism, Hospitality and Gastronomy. Over the past 50 years, CETT-UB has become the international gold-standard for academic excellence in the fields of tourism studies, hospitality management, and gastronomy. The school is very closely linked to the tourism, hospitality, and gastronomy industries on national and international levels, through projects, research, professors, and partnerships. All CETT-UB professors have been or are currently active in the tourism, hospitality, and gastronomy industries, bringing real world experiences and knowledge to the classroom. CETT-UB actively participates in the sustainable development of the industry through education, research, innovation, and expert knowledge. CETT-UB offers undergraduate and postgraduate degrees, professional training, and continuing education for active professionals through its own educational model recognized by the European Higher Education Area (EHEA). Programs are delivered in close collaboration with professors from the University of Barcelona and professional experts from the industry. Students enjoy access to state-of-the-art classroom facilities, demonstration and training kitchens, and student-run onsite restaurant and coffee shop. Classes are taken at the CETT-UB Campus located 25 minutes by metro from the CEA Barcelona Center. Teaching styles in Spain may differ from those in the U.S. Be prepared to adapt to the CETT-UB’s classroom structures and coursework expectations. Class size ranges between 10-40 students. Treball insuficient per a assolir els crèdits de l’assignatura. More work required before the credit can be awarded. El rendiment assoleix els criteris mínims. Performance meets the minimum criteria. Per sobre de la mitjana, malgrat alguns errors. Dr. Martinez ensures academic quality, supports faculty to guarantee academic excellence, and facilitates the award-winning, experiential Academic-Integrated Cultural Activities Program. She holds a Ph.D. in Spanish Applied Linguistics from Georgetown University. Before joining CEA, Dr. Martinez was Assistant Director of the Advanced Spanish Language Program at Georgetown University, Teaching Associate at Universidad Antonio de Nebrija, and Director of Middlebury College’s Spanish House.